He returns to a familiar place, with an equally familiar opponent. Manny Pacquiao is taking no chances when he meets Timothy Bradley in what could be the last fight of his remarkable career. There's chatter in the background about a possible rematch with Floyd Mayweather Jr., though that appears very unlikely. Their hugely hyped fight last May was a dud, and Mayweather has shown no interest — at least publicly — in changing his mind about retirement. 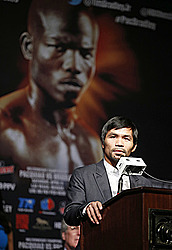 Pacquiao could be headed there himself, even if he beats Bradley in the rubber match of their series. He's running for Senate in the Philippines, a job that takes far more time than his current position of congressman in his native country, and polls make him a favorite in next month's election. Pacquiao might solidify his position in the polls with a win over Bradley in Saturday night's welterweight fight at the MGM Grand, where he met Mayweather last May. Everyone loves a winner, though Pacquiao is already beloved by most people in the Philippines as the biggest sports hero the country has ever had. Indeed, Bradley said he would be in Pacquiao's corner if he had a vote. "He's shown over and over that he is for the people and by the people and that he's a man of his word," Bradley said. "He's always shown that character and that integrity and I think he's the right man for the job." Pacquiao has waffled about whether this is his last fight, saying he still loves boxing but his family wants him to retire. Trainer Freddie Roach said he believes Pacquiao has benefited from a year's rest after the Mayweather fight and can go on at age 37, even though he hasn't scored a knockout since 2009. "He hasn't slowed down at all," Roach said. "He still has a couple fights left in him." Pacquiao is guaranteed $7 million — a far cry from the $100 million or so he got to fight Mayweather — to meet Bradley again in a pay-per-view fight that is struggling to get noticed. With good reason, because there's still a hangover from the Mayweather fight and he and Bradley have already fought 24 mostly nondescript rounds. "He will be remembered as one of the best fighters who ever put on the gloves," Bradley said. "But I'm a different fighter than I was in the first two fights." Bradley won the first of those fights on a highly controversial decision, then faded in the later rounds to lose the second bout. He says he is rejuvenated under new trainer Teddy Atlas, the longtime ESPN broadcaster whom he convinced to return to boxing to train him. "Having Teddy is like having a cheat sheet. He analyzes fights," Bradley said. "This fight will be fought differently. I'm going to be a lot smarter than I was the first two fights." Pacquiao is a 2-1 favorite after shoulder surgery and a long rest in the Philippines. 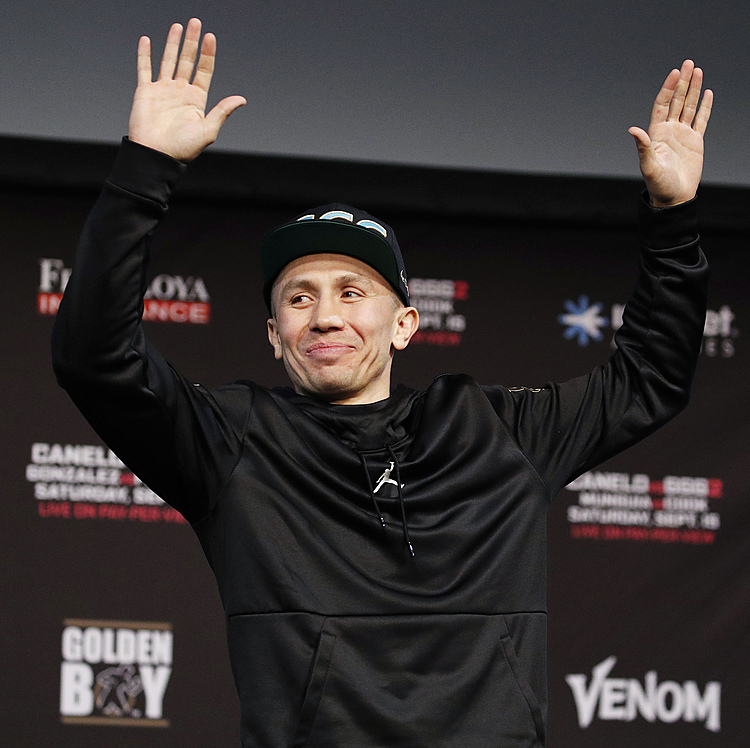 The winner of titles in eight weight classes — the first one coming 17 years ago at 112 pounds — he hasn't had a knockout since 2009 though he was on the receiving end of one when he lost to Juan Manuel Marquez. "I feel it's good that I had a long layoff," said Pacquiao, who began his pro career as a 16-year-old in 1995 in the Philippines. "It makes me hungry again, makes me fresher." Not feeling quite as good is promoter Bob Arum, who has struggled to sell the fight. There were tickets widely available in the days leading to the bout, and pay-per-view projections have been scaled down. Mayweather had trouble selling his last fight, too, drawing relatively meager pay-per-view numbers for what most considered a noncompetitive bout against Andre Berto. The low numbers for both fighters indicate fans are wary after buying the Mayweather-Pacquiao fight. Arum has tried to generate more interest by trumpeting a "No Trump" undercard of mostly Hispanic fighters he said will strike a blow for immigrants. "My Hispanic army is marching," Arum said.